Love old-school Hollywood, especially silent film stars, Mary Pickford and Douglas Fairbanks - even if I can't name a movie I've ever seen with them. Seriously. They were famous, the Brangelina of the 1920s - complete with a grand estate called Pickfair, where old-school Hollywood used to party like crazy. They divorced in the end, but I refuse to accept it. Through a weird twist of fate, Pia Zadora demolished Pickfair after it fell into disrepair...which I also refuse to accept. 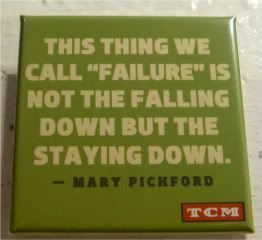 Failure's another word that I refuse to accept, which is why I love this quote from Mary. It's true. When you get knocked down, and you stay down, that's when you fail. It's why when the company laid me off after more than a dozen years of service, I didn't let it get me down. I didn't cry or even talk it over with them, I just accepted the package and moved on happily. It was time. And yet, oddly, eight months later, I find myself absolutely vindicated, freelancing for two of my former (and favorite) clients, both of whom squee'd happily when they welcomed me back on the team. Hearing their welcoming cheers was completely happy-making and gratifying, to say the least, and I thank them both for what's possibly the best work feeling I've had in a few years. Mind you, though it has very little to do with me leaving, I find it even more vindicating that I'm actually working on exactly the same projects I was working on, after the work had been taken away from the former agency, and given to other agencies. As my client put it when she introduced me to a new team member, "She was working with [company], but she's on her own now, and she came down to help us out this week." It wasn't until I heard her say the words out loud that I suddenly realized it was true. I am on my own. I'd taken a fall, but here I am. Still standing. On my own two feet. It's a weird feeling, but one that I don't mind. Joy, you aren't only still standing, you are hopping, skipping and jumping. You seem happier then I've seen you in years (and remember, I've known you years), are doing great work as you've always done, and don't have all the nonsense piled on that takes away from doing great work. You are the best.